Air craft: The Douglas DC-3 is an American fixed-wing propeller-driven airliner which revolutionized air transport in the 1930s and 1940s. By the end of 1936, orders for 100 aircraft had been placed by several airlines. The DC-3 was a hit with the aviation industry, earning praise as it surpassed even the DC-2 with its combination of speed, comfort and safety. 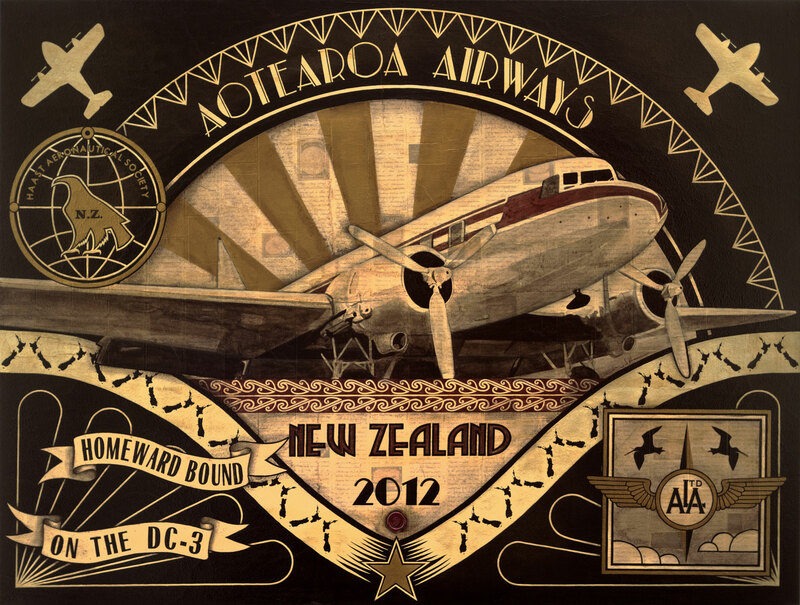 Aotearoa Airlines Ltd logo/wings: This was inspired by the five ‘wings’ insignia of the NZ provincial airline main trunk operators between 1934 and 1947. The two white bird motif’s represent the godwit or in the Maori language ‘kuaka’ . Kowhaiwhai (scroll design): The inspiration for this Kowhaiwhai came from: Ngaru, a traditional Maori design representing the cutting of the waves as the ‘waka’ moves through them and the word ‘waka’ is used in many ways in the Maori language examples.